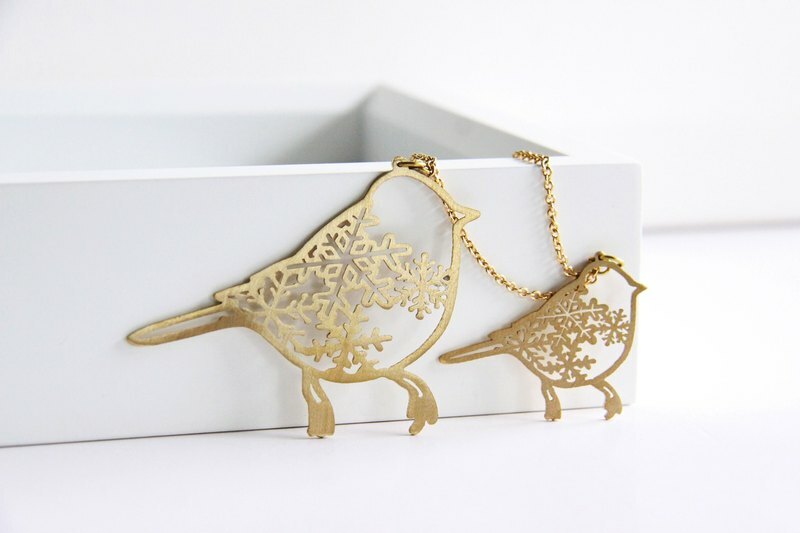 The necklace features an illustration of my own graphics of mother and baby bird with snowflake details in golden tone. The jewelry is made of brass sheet material and cut by hand in every detail. Hanging with long brass chain. Measurements & Objects Info • The mother bird measured approx. 5x3 cm. / The baby bird measured approx 2x2 cm. • Total length of chain is approx 72 cm. • Weight: 20 g. • Lobster clasp • Material: brass * If you need other length of the chain please leave message to us during the checkout. We'll adjust with no additional charges. * Your item will arrive in our beautiful gift box.